You: Not much can top having a slice of pumpkin bread for breakfast. Me: How about en ENTIRE loaf of pumpkin bread? You: Wait, a whole loaf? Yeah, that definitely tops one slice. Me: How about en entire loaf of HEALTHY pumpkin bread? A sweet and cinnamon-y bread that’s good for you but doesn’t taste like it. You: No such thing exists, duh. Me: Oh yes it does, my friend… and it’s nutritionally balanced so you will feel full for hours. It’s high fiber, but doesn’t taste like cardboard, it’s high protein, but isn’t savory like a slab of dry chicken breast, and it’s sugar free, but is perfectly sweet. You: Are you for real? If such a pumpkin bread exists, I’d like to see some proof. Spray a ceramic mini loaf pan with cooking spray. 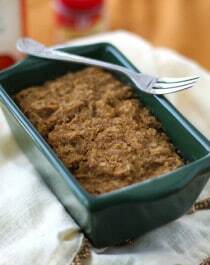 In a medium-sized bowl, stir together the flax, almond milk, pumpkin, apple pie spice, truvia and salt. Stir in the protein powder. Then stir in the quinoa flakes. Scoop batter into the prepared pan, tap on the counter to level the batter, then microwave for ~5 minutes, or until surface springs back when tapped. Let cool slightly, then dig in! 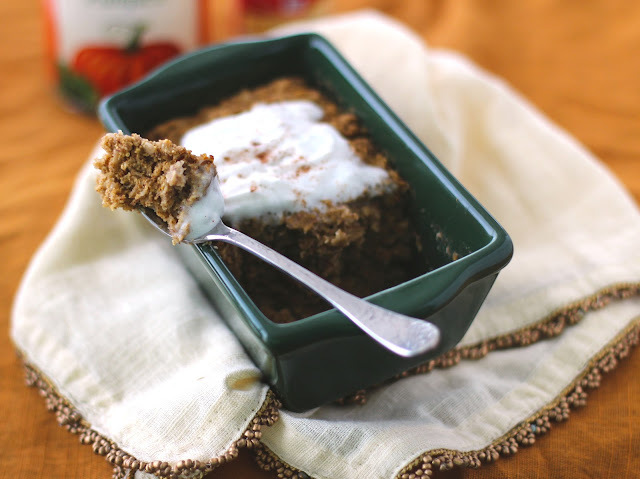 Some delicious toppings for this Pumpkin Quinoa Flake Protein Loaf include: your favorite nut butter, diced apples, pure maple syrup, raisins, all natural whipped cream, a dash of apple pie spice or cinnamon, crumbled pecans or walnuts, etc. 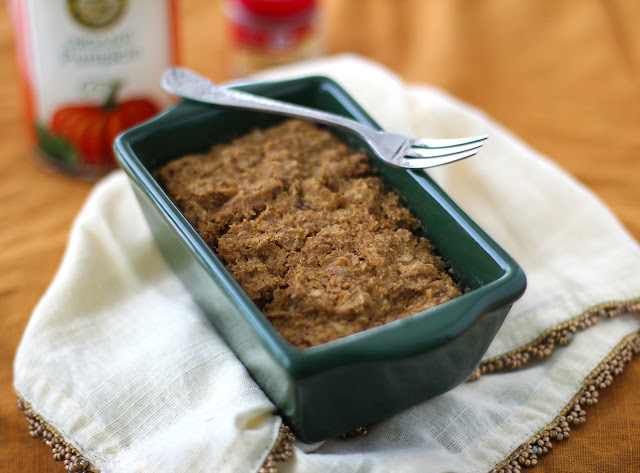 This Pumpkin Quinoa Flake Protein Loaf was so filling I could only eat half and saved the rest for later. It’s like your own personal loaf of pumpkin bread… except without the refined flour, white sugar, brown sugar, butter, etc. This loaf is incredibly nutritious, packed full of vitamins and minerals, but sure doesn’t taste like it! So moist and muffin-like. What are you waiting for? 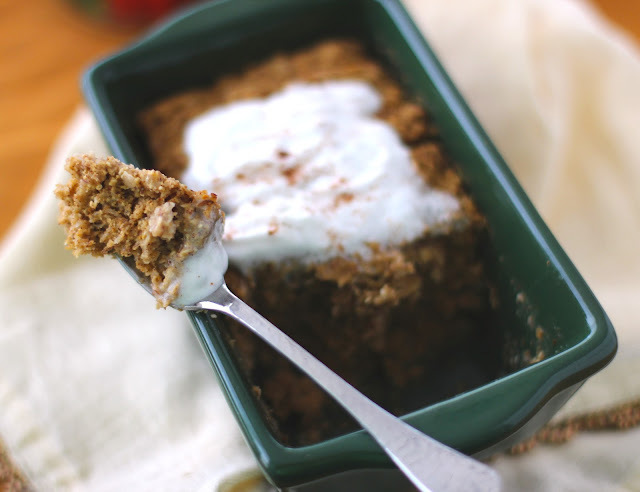 Make this Pumpkin Quinoa Flake Protein Loaf RIGHT NOW! I don’t own a microwave and don’t believe in cooking with them. This looks amazing and I’d like to try it. What are your suggestions for baking it in the oven? Also, could I use muffin tins instead of a mini loaf pan? Don’t have that either. Thank you SO much!! I would recommend baking at 350 degrees Fahrenheit for ~20-35 minutes (depending on the size of the muffin tin). Good luck! Your pumpkin loaf looks amazing! I’m always looking for ways to add a little more protein to my breakfast, so I’ll have to give this a try. 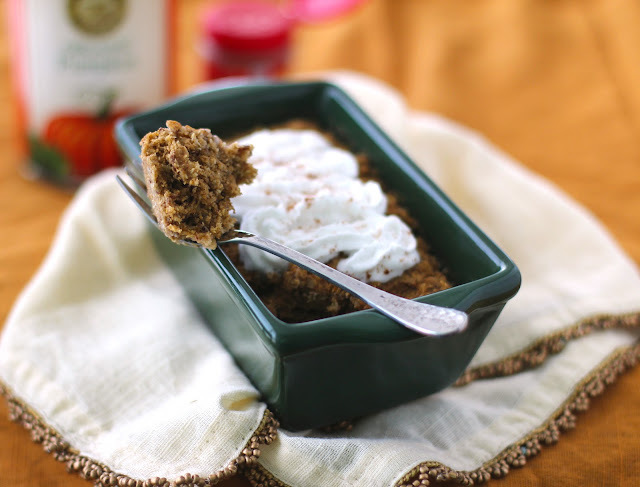 I love making quick breakfast bakes with quinoa flakes, so I’m sure I’m going to love this recipe too. 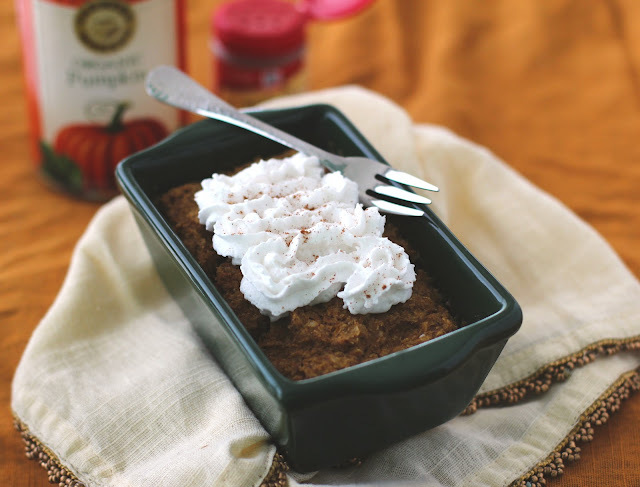 I’ve made this pumpkin bread twice since you posted the recipe, and I love it! It tastes amazing, and I can’t believe how healthy it is. I used vanilla soy protein powder and it worked great. I’ll definitely be making this often. Thanks for sharing the recipe! I’m happy to hear the soy protein is a good replacement for the rice protein. I’m so glad you liked the recipe, Kerry! I am definitely trying this soon! I love your blog and your recipes, you’re amazing! 🙂 Thanks for another great dish! What do you mean by quinoa flakes? Cooked quinoa, correct? Quinoa flakes are very similar to quick-cooking oats, they are super thin and light like confetti. I linked the product in the recipe. I don’t have quinoa flakes, so I was just wondering, would buckewheat work in any of these recipes? It seems kind of flakey.. I don’t have any protein powder, would it work without it? I’m afraid this recipe won’t work without the protein powder. It acts like a flour and thickens up the batter, while also providing flavor and texture.